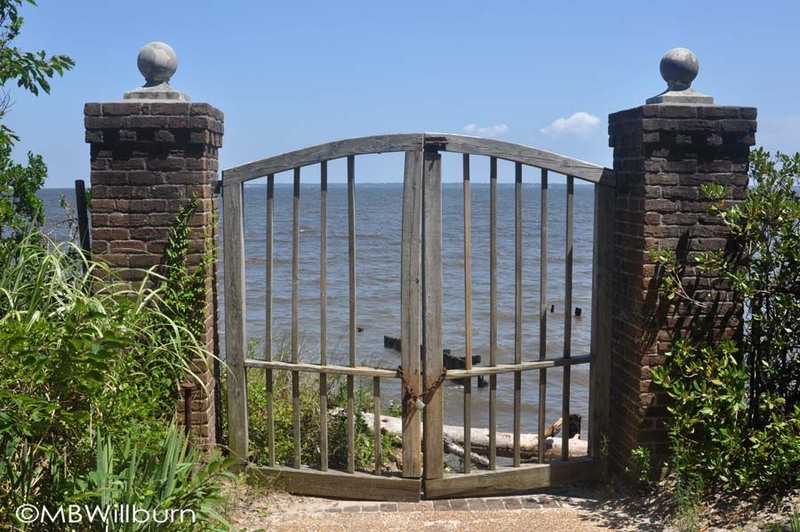 How many gardeners are currently being held against their will in beach houses up and down the Outer Banks while their families burn themselves crispy on sandy beaches? 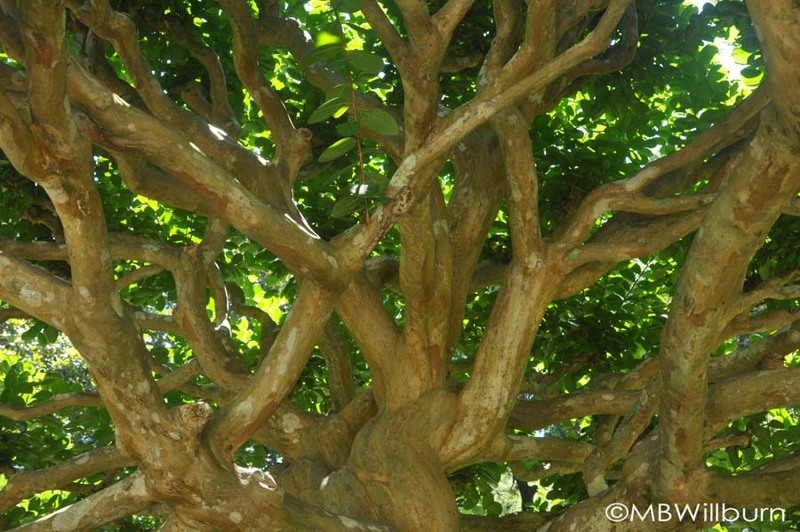 Gardeners get all that sun nonsense at home – in fact we can rarely get out of it. 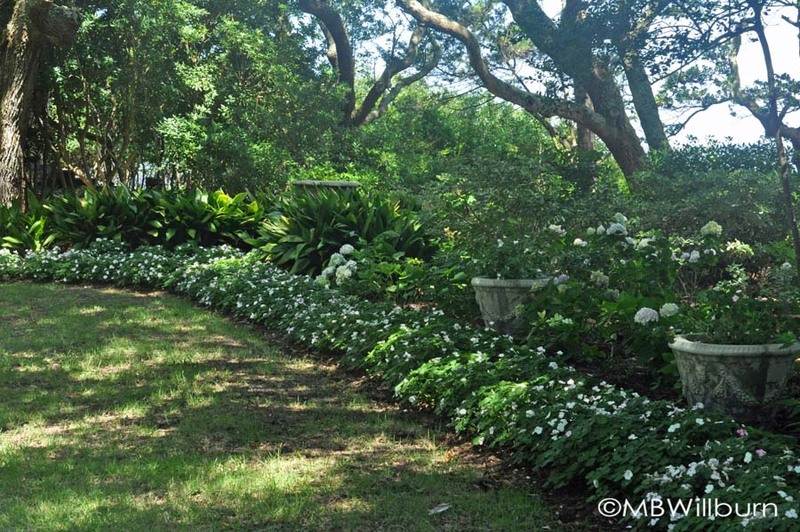 How much better then to interrupt the day’s regularly scheduled program of sun and surf with a little garden touring? 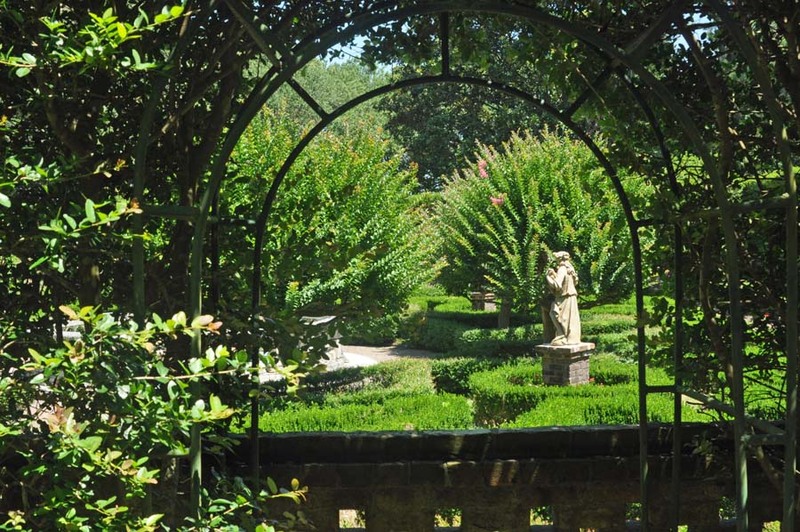 If you’re in the Outer Banks area (and it does feel like there are currently more here than are not here), consider a trip to visit the 10 acre Elizabethan Gardens in Manteo within minutes of the historical attractions at Festival Park. It would be wildly historically inaccurate to propose that the 16th century settlers of the lost colony on Roanoke Island had any time between forging nails and walking a mile to the nearest spring to actually lay out a traditional Elizabethan pleasure garden, but that’s not the point of this lovely space brought to us by The Garden Club of North Carolina in 1960. 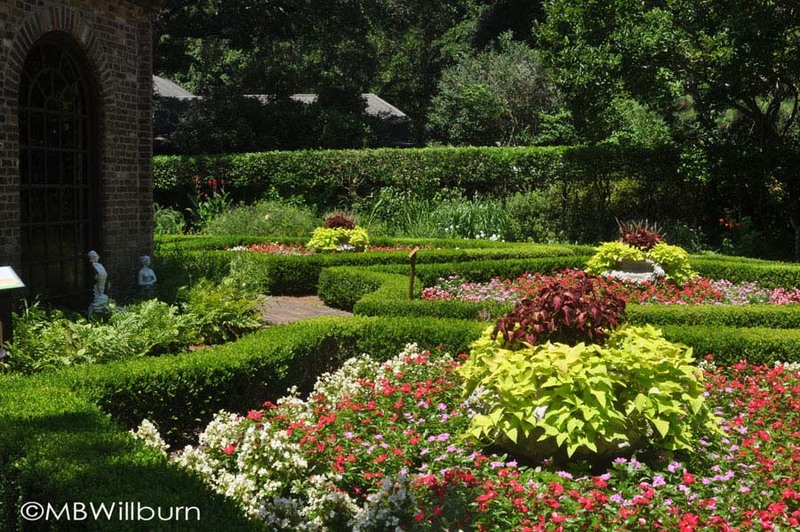 Instead, the garden is intended to give the visitor a feel for traditional gardens of the period and respond to the challenging conditions experienced by any gardener on this North Carolina coastline: heat, humidity, salt-spray and occasional devastating hurricanes. 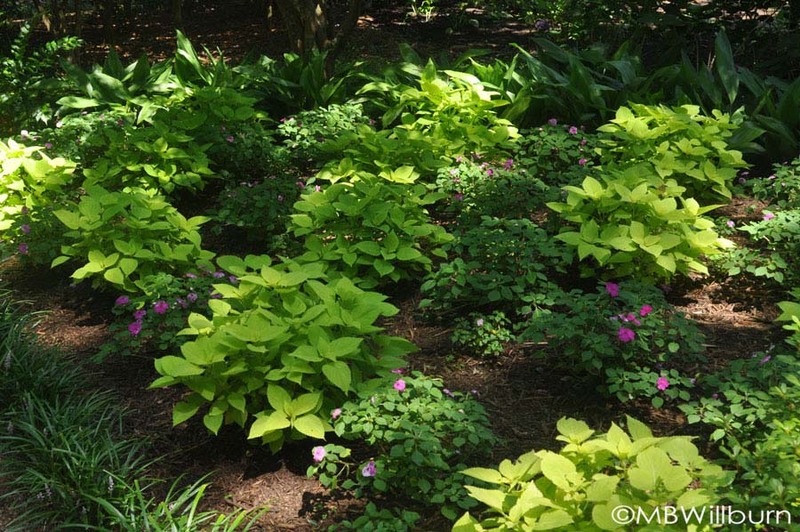 They do so admirably, and thanks to the help of a forest populated by massive (and ancient) Southern live oaks (Quercus virginiana) – the visitor is able to experience much of the garden whilst shaded from the intense sun. 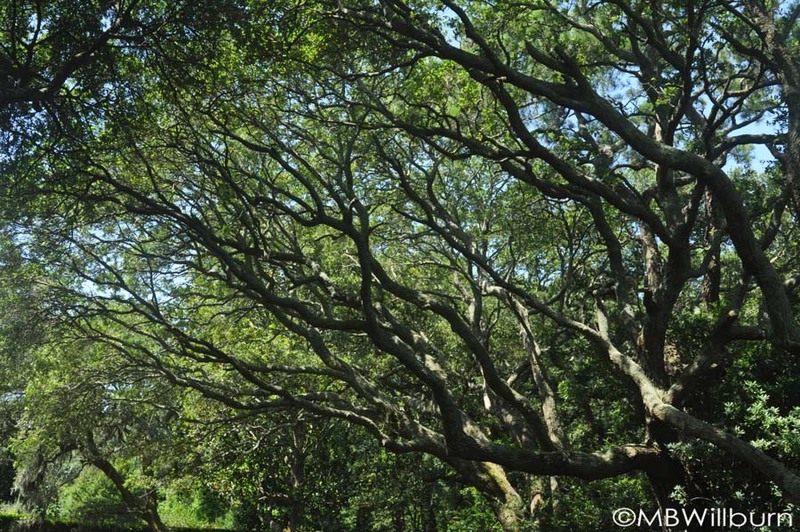 The garden takes full advantage of its perch on Roanoke Island – and indeed there are many points upon which the visitor can watch the water lapping against twisted trunks and old pilings. Those who designed and built these gardens went to great pains to build its structures in the style and manner of the 16th century, including a small thatched building with three bays open to the water which was constructed with wooden pins instead of nails. But the sun beds are numerous as well, and take shape with more formal planting in the Sunken Garden and the gardens near the gate house (which was built in the style of a traditional orangery). 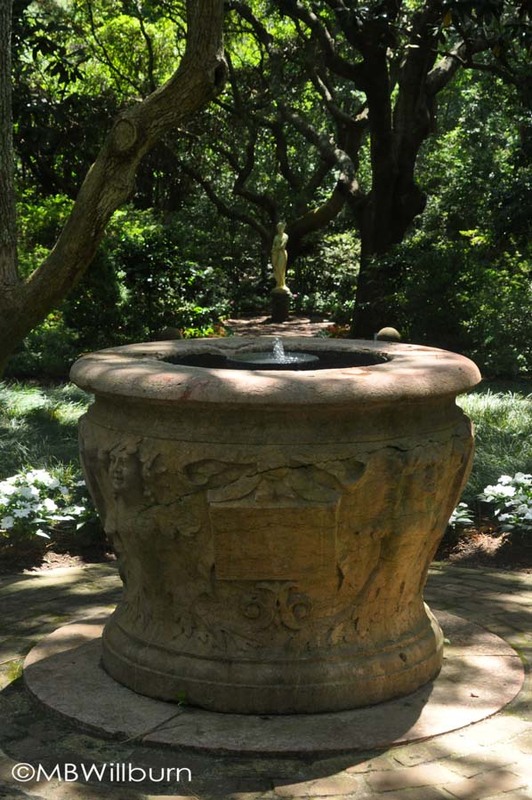 With the acquisition of many rare pieces of statuary, including a 16th century Italian fountain that now graces the Sunken Garden, the original concept for the gardens morphed to incorporate and showcase these treasures. 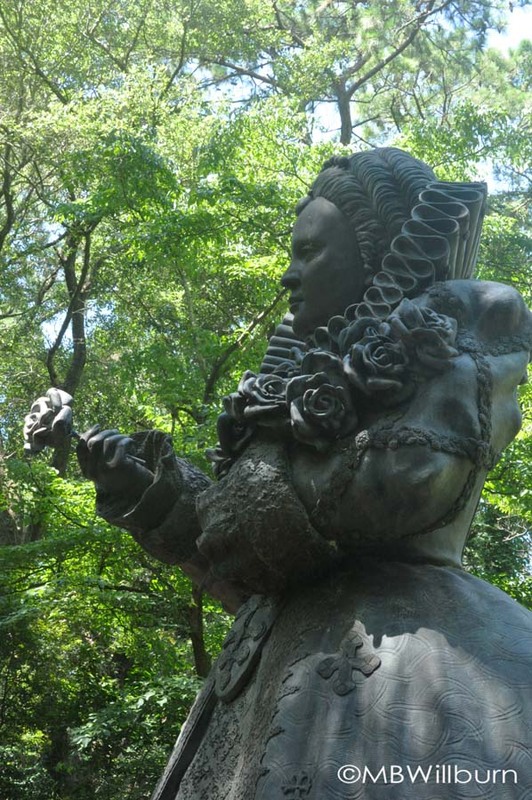 Though they all have an interesting history, none compares to that of the statue of Virginia Dare (first English child born in the Americas), which spent two years at the bottom of the Atlantic off the coast of Spain after a shipwreck. 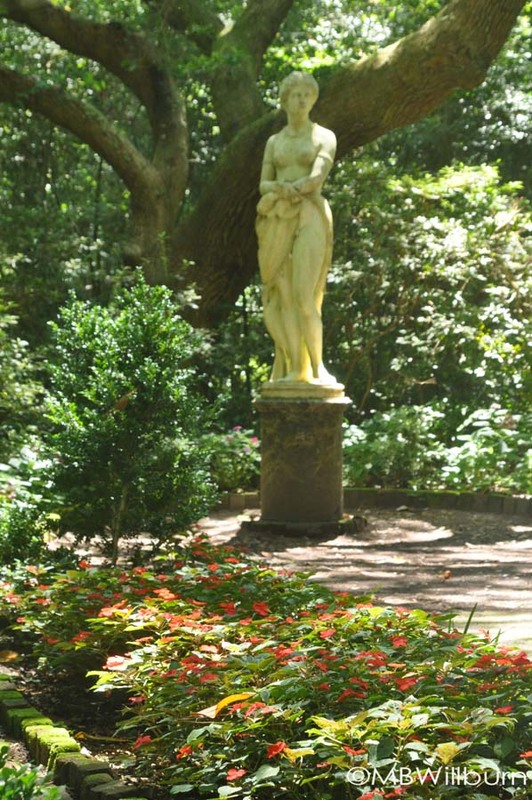 This idealized version of Virginia as she might have looked as an adult living amongst Native Americans, now stands serenely at the end of walks lined with impatiens and box. 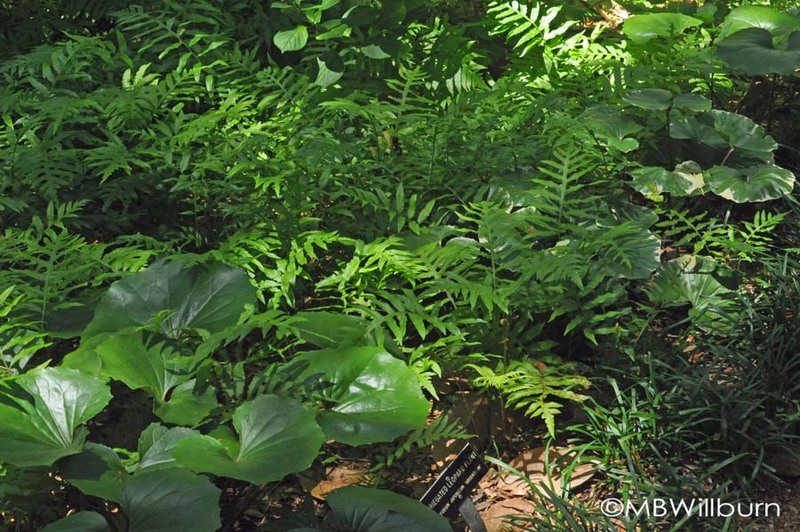 The garden is filled with Fatsia japonica, Danae racemosa, Sabal minor, Farfugium japonicum, and many cultivars of hydrangea, aucuba, aspidistra, hosta and fern. I also had the distinct pleasure of finally approving of crepe murder, in the form of four exquisitely pruned crepes in the Sunken Garden. And, just to finish off the trip (and finish up my long-suffering husband and a friend visiting with us), the garden boasts a small nursery where property-grown plants are available for sale, some at excellent prices, and many on that zone line of 7a/7b that force me to consider my stance on zone pushing once again. This is my poor husband, asked/ordered to hold a little Daphne and find somewhere to sit. Which he did as close to me as possible so he could curb the buying frenzy. 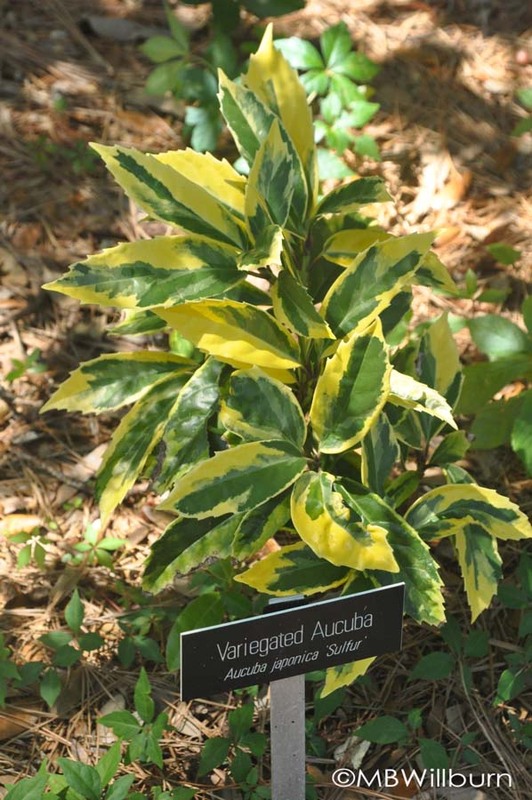 This aucuba was available in the nursery, and even though they are a major pain to grow unless you give them the perfect conditions (and I am currently just finding those for ‘Picturata’), I was way too taken by the bold yellow foliage on this one to pass it up. The gardens did an excellent job at labeling their plants – which is no small feat in a garden this big with a small budget. 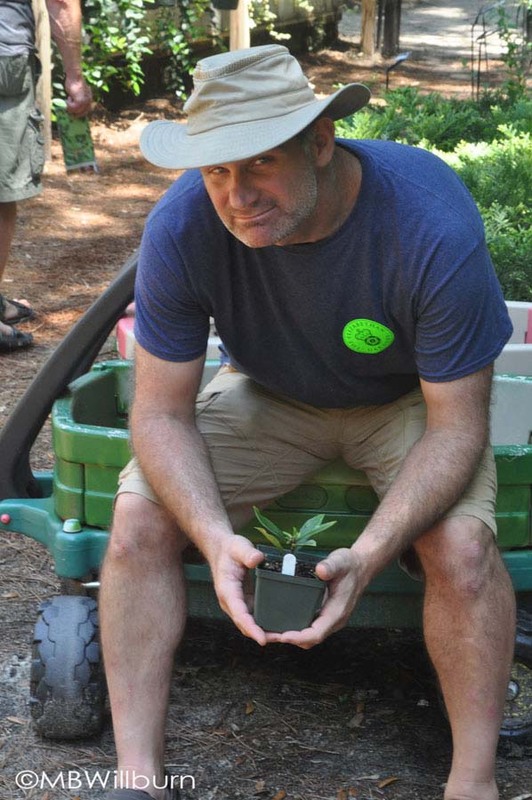 It’s a smart move – this usually means more $$ spent in the nursery at the end. 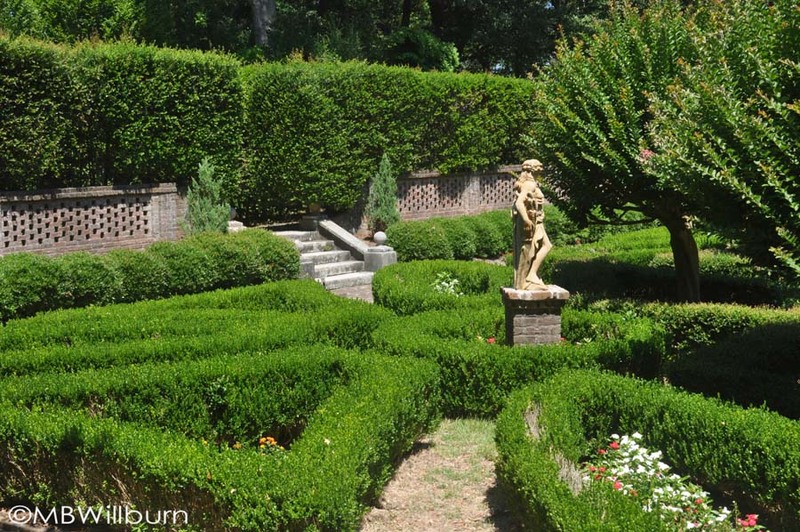 If you’ve had one day in the sun too many, consider grabbing your hat, a camera and any other garden lovers sharing a vacation with you and take a day trip to these gardens. 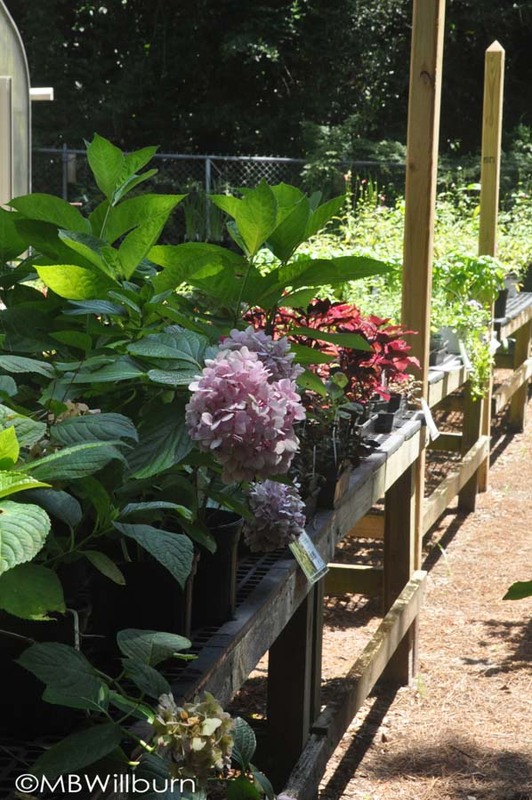 They open at 9am which makes garden touring infinitely more pleasant, and allows lunch in the nearby scenic town of Manteo before perhaps heading over to the Festival Park to tour the historical attractions. And save a bit of money for the gift shop, whose tempting bits and pieces bear absolutely no resemblance to the cheap beach souvenir tat you’ve been staring at all week. 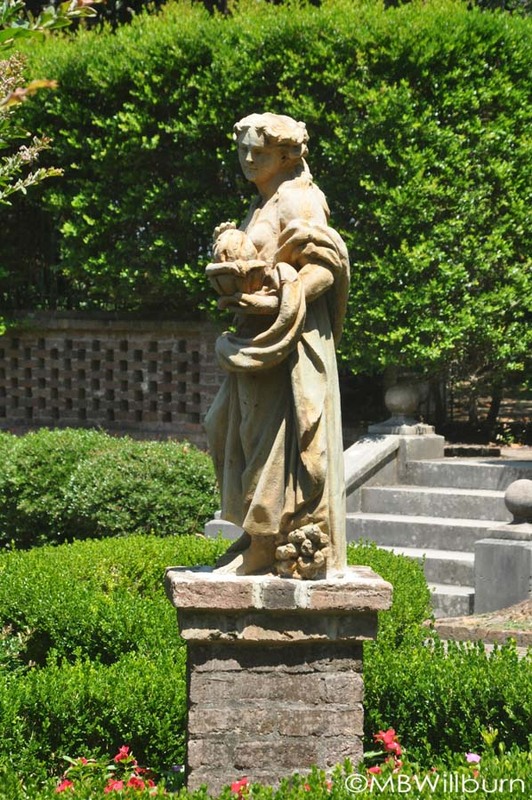 For more information, particularly on the history of the gardens and the history of some of the rare statuary, visit their website at Elizabethangardens.org.